These labels add just the perfect personalization to my hand sewn products. I have ordered these a few time and really like them. Micki assisted in ordering the labels and was helpful and pleasant! Nice person, nice company, thank you for continuing to make LABELS!!!! I use the labels on quilts that I make for new born babies of friends or people that we meet as we go about. Love to be able to put my name on the quilt. It makes it so much more special to the new Mother to receive something hand made for her baby. Love the labels as they last through all the washings that they receive. Wonderful Finishing-Touch to my Quilts! I add these "Made Especially for You" labels to the Quilts I make for gifts. They are the prefect finishing touch - look professional and let the gift recepiant know I made this just for them. The labels allow me to personalize my knitted items that I give as gifts. I use these labels on all of my crafts. It is just my own personal touch to the things I make, whether for gifting or for sale. This is a Christmas present to a daughter-in-law. She sews and I love mine so much that I thought she would too. The perfect gift for a knitter. Lets them show pride in their work. Very affordable and unique to each purchaser. I have sewn them in my scarves I knit for Christmas presents. I have bought these several times. I have bought these for my dad, my sister and myself. My dad lived with me for four years and embroidered all the time and he loved putting his name on what he made. He made pillow cases, dresser scarves, and quilt blocks. He passed away Nov. 2009, and I have so many things he made and labeled. My sister and I sew and quilt and make things for other people and we love them and use them a lot. I crochet gifts for family and friends and I just love being able to put this finishing touch on my work/gift. 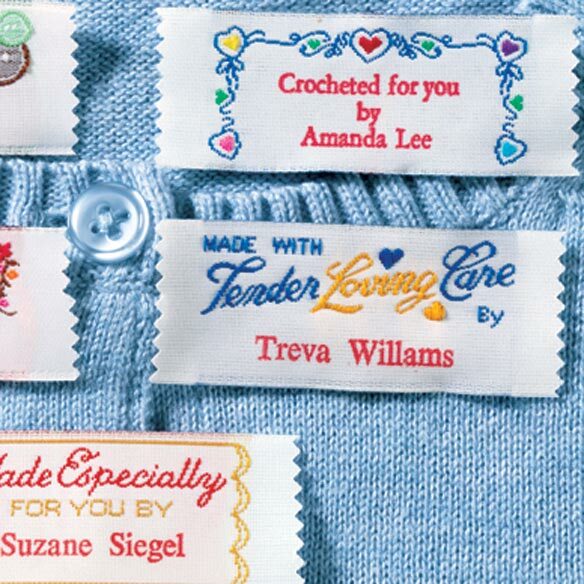 I love to add these labels on my sewing projects I make and give as gifts to the Grandchildren and to my friends. 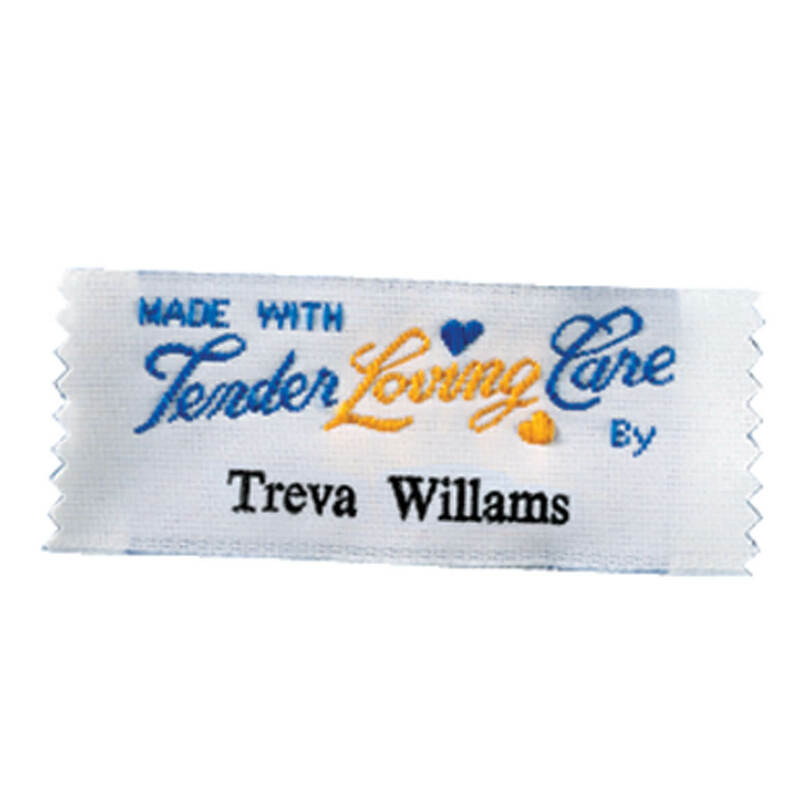 I just received the personalized labels to sew on to my hand-crocheted baby blankets, etc. They arrived earlier than expected and I am very satisfied with the quality. Looks nice on a handmade item and I hope generations to come will smile when they see my name. I use this item to personalize my cross stitch gifts. This is my 2nd order of these tags. The first one was made especially for you by and my name. I got these labels to mark my work when I make gifts for other people so they know where it came from and tht I made it especially for them. I love these labels, I have re-ordered them three times. You must not be in a rush to get your order, I would estimate it takes at least month. However, it is worth the wait. Miles Kimball. I love to add them to homemade gifts and everyone gets a kick out of them. These are perfect to use on my quilts to identify that I have made them. Excellent labels that shipped very quickly. I always get compliments when I put them on my handmade items. My cousins liked them because they were peronalized with their name & not general (like aunt or mom). Neither of them had seen any like it. Thanks for having what I needed. When I give a handmade gift with my labels sewn in, the labels are noticed as much as the gift. I use these labels on gifts I sew. This was a second order as I had used up the first batch. I attach these to my quilting and stained glass (fabric) items I give to family, also on craft items I make and donate to a local nursing home that are used as bingo prizes. It gives them a personal touch, and lets the next generation know who made the article. More important than that, it lets the residents in the nursing home know the item was made "Especially" for them. That's important. My mother had used these when I was a child to personalize gifts that she'd sewn for others. I have looked for them for YEARS! I am so happy to find them. I like knowing that people won't forget that I made them that item. They are easy to sewn on. Some of the tags are kind of odd colors, but most are pretty. Why try to make a label on a printer for a quilt when a premade personalized label can just be applied to the finished product. It signs your work and does not appear too large for the new quilt owner. Highly recommended for arts and crafts. The one things that annoyed me is that they debit my account a month after I ordered them and instead of the time that I made my order...this should change....other than that, I love the labels very much and would probably order them again. These are very cute, and reasonably priced. The perfect give for my knitter!! I crotchet dish clothes and give them to whomever would like one. I wanted a more personal touch and also wanted recipients of my gifts to be able to remember how to get another one, so I purchased this product. Then I received a gift!! A knitted dishcloth!! What better way to say thanks than to share the gift of personalization! I'm sure she will appreciate this item as much as I have. Fun to add to my kitted projects. The product is name lables to sew in hand made items. The quality of this item was not what I was expecting. The tag itself is decent enough (though still cheaply made), however, the personalized name was simply printed on (not stitched), and the printing was poorly done. There were a few extraneous printed marks besides the letters of my name. I'm planning on sending them back and not re-ordering them. I haven't received them yet! Still waiting on order to arrive to my mother???? I would NEVER buy this product of shop here again! 0 stars! This product was horrible. It was as if they pulled old labels out of storage and personalized them. Then they refused to give my money back even though "satisfaction guaranteed" is on their website and their paperwork. NEVER ORDER THESE! Ordered a month ago and apparently it takes a long time to ship them. I would enjoying rating this product if I had received it by now! Since I have not yet received my order, I cannot write a review yet. It seems to be taking far longer to get these made than I thought it would. Where are they manufactured? Is it in the USA???? I had hoped to have them to give as a gift for someone whose birthday is 1/6 and today is the 22nd of January and I still don't have them! I haven't yet received this product - it was ordered a month ago! If you have shipped, please track! I have to return the labels as I told the person taking the order her last name is Stov (v as in victory)er. They arrived with spelling of Stober so I guess that person knows what Bictory means - I don't. Have ordered these before...sew them into my handmade purses..they are the perfect touch for anything handmade.. I have ordered before and they are very nice. Good quality and I like better than so many others I've seen. I am always pleased with these labels, which I have ordered several times before. They are made of quality fabric and thread for the lettering. They stand up well in the washing and drying. 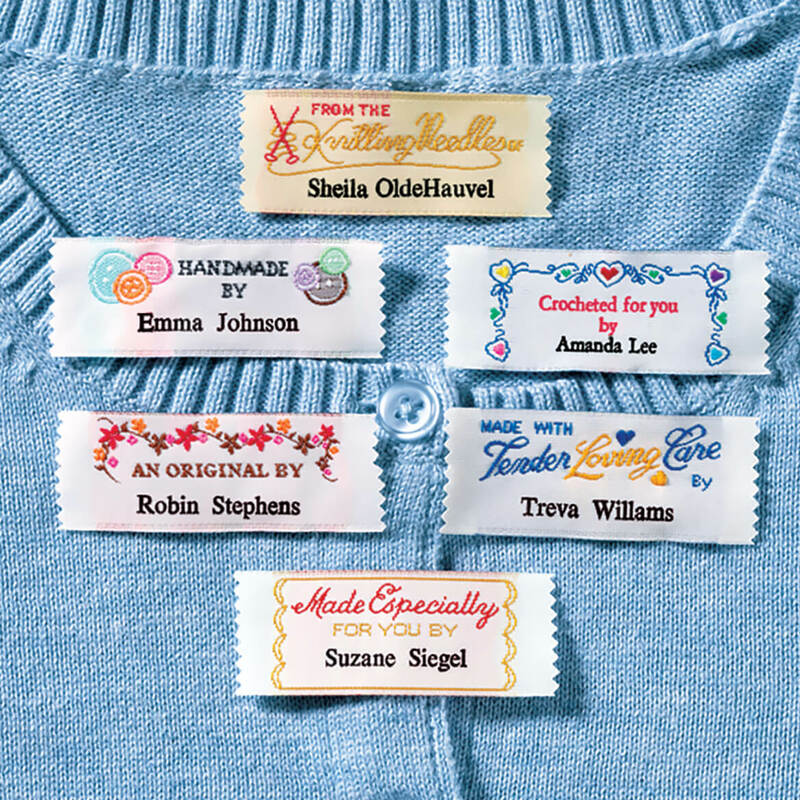 I have been looking for personalized Knitting labels for a long time and found them here in your catalog. I chose this because the words on the label are very meaningful. I can make sure my clients know I make my products with care. I can't get them anywhere else. I would like to have my name on my work. 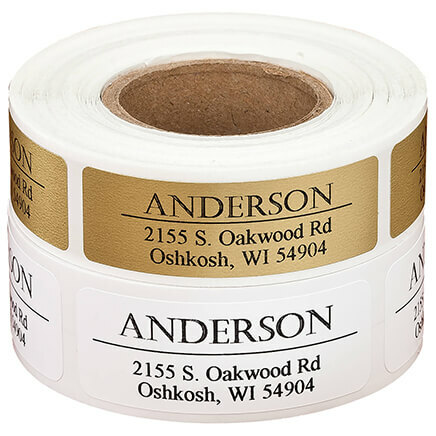 Because I've been ordering labels from MK for 30 years, and they have always been consistent in quality. I have used these before, they add a personal touch to handcrafted items! My niece is showing great potential as a seamstress. I thought this would give her an incentive to perfect her hobby. I knit a lot of gifts and always like to put a label in my knits. Family members recommended Miles Kimball as a good source for these labels. I can't wait to see them as I have several knits I'm giving away soon. Used similar items before from a different company and they worked great. Hoping I have same results. Good quality label. Family likes to see who made different items. I have used these labels before on items I have crafted and feel they add a personalized and professional edge to the item. They are well made and easy to apply. My wife just started knitting and completed her first project. Because it's perfect for my crochet projects. This is a birthday present for my daughter-in-law. She is knitting sweaters for her new grand daughter! 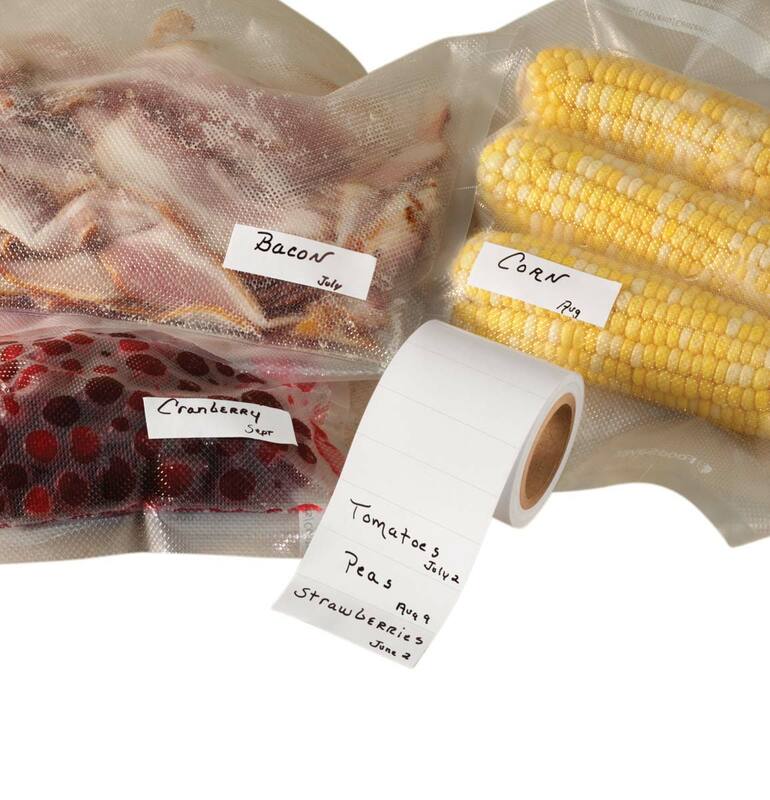 Love to add these to my homemade items! Exactly what I was looking for and very cute! give as gifts hand made item. With label they will always remember who gave it to them and feel special. My friend quilts and the labels will be nice for her to attach to the quilts she makes. I bought these for friends who sew or knit, and they love them. I have used these labels for years and now need labels for my first Great Grandbaby. They are well made, have lasted many years through washes on baby and childrens blankets and clothes. And since I can personalize the labels it's a great label. I chose this label because I wanted a woven label that I can sew directly on my finished quilts. It displays a personal touch for my projects. Want to place in items I am making. Priced right for my sewing habits! Is the personalized name woven, or printed with ink? Thx. BEST ANSWER: My order has not been received as of 12/1/2014 as the vendor requested a 5-6 week allowance for processing. I ordered 40 total labels on 11/10/2014 to sew into the hem of all my deceased mother's quilts. Will post a review on Miles Kimball as soon as the order is received. BTW... I have seen these same labels offered in local quilt store for the same quantity but the price was much higher and you had to write the name yourself. 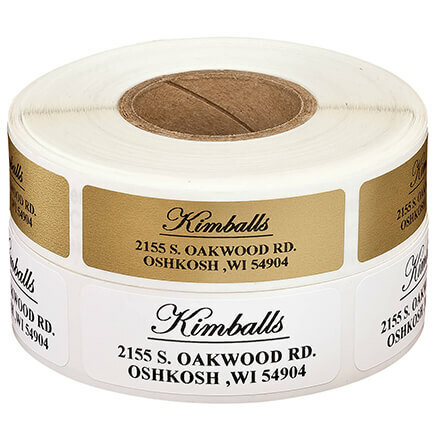 Purchasing labels from Miles Kimball seemed to be a better option. Update to my review...... rec'd my labels on 12/4/2014...ordered on 11/11/2014. Good job on the name printing. Most impressive was the fact my late mother's first name was spelled correctly. Happily, the labels were larger than expected. Her name was printed but the design on label is woven. Good buy at exceptional price. The name is printed. I have used Miles Kimbal labels for years and never a problem. Even the iron on for kid clothes stood up to washing. Thank you for your question. The personalization will be printed on the label in ink.We hope this information will be of help to you. It looks like the name is printed but all the rest, including the little hearts and scroll work looks like it is woven. The flowers are woven but the name is printed in ink. Mine is the same shade of red as the flowers. Looks real nice. printed ink, but they are nice. "Handmade" & buttons are lightly woven. Everything was woven except my name, but I am very pleased with them. The personalized name is printed with ink. BEST ANSWER: Yes. There are 20 labels of the same design with your name on each. Each has a finished edge with the main part of the label stitched and your information stamped. I've used this type of label from Miles Kimball for years. They hold up well when washed with your clothing. they are individual labels. The quality is good. I ordered two different kinds as I wanted my name different for items that I make for my grandkids. Delivery time was about 3 weeks. You have to pick out which individual label you want. I am very happy and satisfied with my label that I choose. Made of good quality and easily readable. Yes. Each one are cut to the size. The name you have put on looks like it is silk screen but the saying looks like it is embroidered. Yes, each one is separate. I've gotten some that were in one strip and I had to cut them with pinking shears. Yes, they are individual. They have side edges cut with a small pinking shears. They are nicely done. Yes they are. I used them on my crocheted items this Christmas. They were great. Yes you get 20 individual labels. I always order the "Made Especially for You". Yes they are. They're very nice. I think you'll be satisfied with them. Do these iron on or sew on? BEST ANSWER: They sew on. You could make them iron on by putting a little strip of stitch witchery between the label and your fabric. I just sew mine on the machine around the edges. I've also hand sewn them for a more invisible seam. Thank you for your question. These are sew on labels. We hope this information will be of help to you. These are so sew on labels... You can either hand sew or machine stitch them on. These are sew on. They are a bit hard to sew on crocheted items, but it still works. These sew on and are a snap to do. They also are very durable. These are sew on labels. Very sturdy. These are to be sewn on. You sew the label on. Are these iron on labels? BEST ANSWER: No, they are not iron on labels. You must sew them on. You could also use fabric glue if it fit your application. They are nicely made labels and very easy to sew. Hi Susan, No these labels are NOT iron on... I have ordered these before and have been very satisfied with them... Just sew them on.... Happy Sewing! You need to sew these labels on. They are easy to do you can use a machine or hand sew on. My Mother had enjoyed them greatly. No. You can machine or hand sew. The "saying" is embroidered and the name you add is ink stamped or screen printed. No - they must be stitched to the fabric. I usually just stitch the ends. No. You have to sew them into your garment. No. These are labels you sew on. No they are not iron on. How do I get my name on to the label? BEST ANSWER: Thank you for your question. 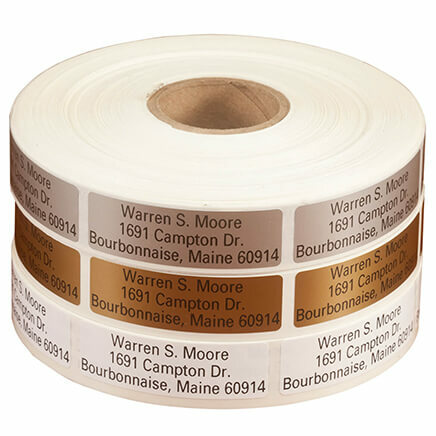 When selecting the design of label you would like, it will ask for personalization. Once clicked you can type the name you would like on the labels. We hope this information will be of help to you. Include your name when you order the labels. Be sure to count the labels when you receive them. I ordered 2 packs (20 each) and only received 32 total! You provide the name you want printed when you place your order. They will make the labels with your name on them. When you place your order you enter the name you want on the label and it comes personalized. I hope this helps. Ordering is simple. Just fill out the order form and put your name. These labels are wonderful and look great. Miles Kimball prints it on for free. how do i put my name on the labels? BEST ANSWER: I usually center the label on the garment and fold over the two side ends of the label and pin it in place. Then I hand stitch just the ends using the background color of the garment. In other words, If the label is going on a navy blue garment, I use navy thread to camouflage my stitches. When I attach my labels to my baby blankets I position my labels in the bottom corner, turn under the 2 zigzagged edges and stitch all around the label in the background color of the blanket so that it doesn't get pulled off by a child. My labels make my hand made item look very professional! Thank you for your question. You will need to select what style you would like. Once selected, click the green personalize button and it will ask for the personalization. We hope this information will be of help to you. you don't put it on. It is done for you when you order. They ask you what you want on the label. They are a great product. I have gotten many packages of these for my daughter. You order them personalized. You put in the info and they are made for you. I have one that reads by Grandma and one that reads by (my name). When you order, there is a place for your personalization. Just spell your name exactly as you want it to appear on the label. Pick what label you want and correctly spell your namename and let Miles Kimballs do the rest. how many letters can you have on a quilt label ? BEST ANSWER: I just put my first name. The are really nice. I make doll clothes for my church and charity . They are the best ! The labels come pre formatted as seen, however they are personalized with your name, I used my "grandma" handle. 18 letters/spaces on the bottom line. Can you get Handiwork labels that say either from mom, mother or from Nana? BEST ANSWER: Thank you for your question. The name can be put as any name. We hope this information will be of help to you. I believe that you can. Just make sure your personalization doesn't go over the letter/space maximum. yes, they are personalized so you can have them printed any way you wish. Yes! You can have whatever you want put on these labels. Where do I write the name for the personal handiwork labels? BEST ANSWER: Once you select a style and click add to cart, you should get a personalize box in which to enter name. I recently purchased the "crocheted" style and promptly received my labels. There should be a separate box for personalization where you can type in what you want. It should be on the same page where you pick quantity and which labels you want. The order form on line is very easy to fill out. Just go to the website, find the order form, and follow the instructions step by step. When I ordered the labels a space came up for me to put in the name I wanted on the label. Before you place your order it will ask you to personalize. Is the design embroided or stamped? BEST ANSWER: The label itself is embroiled. Your name is stamped. I had to look at the back to determine this as I couldn’t really see any difference. It is embroidered. Your name is stamped. They last for years. I have been using these for over 30 years. Is there other styles. Maybe sparkly tags? BEST ANSWER: Thank you for your question. No, these are the only styles. We hope this information will be of help to you. can you do origanal wording? BEST ANSWER: Thank you for your question. The verses are pre-embroider. It is only the name we print. We hope this information will be of help to you. Can I completely customize the labels???? BEST ANSWER: Thank you for your question. You can only customize the name. You select what style you would like, and provided the name. We hope this information will be of help to you. What is the cost of approximately 50 - 100 labels for quilts with this printed on it? Hand Made by the Ladies of Mill Creek Baptist Church. Then a picture of praying hands. BEST ANSWER: Thank you for your question. The set can only come in the pack of 20 and only can have 18 characters. We hope this information will be of help to you. Where can I find personalized labels in Spanish? BEST ANSWER: Thank you for your question. The Handiwork labels do not come in Spanish. We apologize for any inconvenience. Yes, I had ordered two sets of the From the Knitting Needles Marlene Exner When will they be arrriving? Can you make a custom label which would have more lettering? We need labels made with at least 5 lines on it. BEST ANSWER: Thank you for your question. These labels can not be customed made with any design. The only designs available are the 6 designs shown and can only be personalized with one line of personalization. We hope this information will be of help to you. I am trying to send the order off for the sewing labels Made Especially for You by Sue Richter. Can you help me finalize this as I need them soon? BEST ANSWER: Thank you for your question. 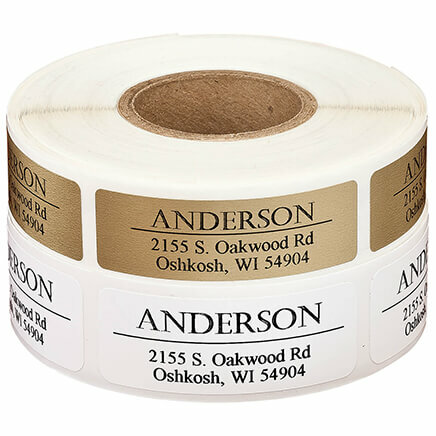 To order the Handiwork Labels in the Made Especially for You labels you will need to select the Especially options from the drop down menu and then enter in the personalization you would like. We also want to remind you that there is no express shipping for this item and it takes 5-6 weeks for delivery. We hope this information will be of help to you. instead of "handmade" on label can i order Hand Painted by and then my name/company??? BEST ANSWER: Thank you for your question. Unfortunately, we do not offer the Handiwork Labels with Hand Painted by as an option, we just have the six options that are shown. We hope this information will be of help to you. HOW MANY LABELS FOR $**.**? BEST ANSWER: Thank you for your question. The Personal Handiwork Labels come in a set of 20. We hope this helps. all 20 the same name? BEST ANSWER: Thank you for your question. All labels will be personalized with the same name.